– Earthbags are not just bags of dirt or sand. Proper earthbags have enough clay in the soil to bind the aggregates together into a solid block. – Use moist soil, not loose, dry soil. – Earthbags are tamped solid, much like rammed earth. Once dry, they are similar to giant bricks. – Raise the building site so water flows away from the building. Walls of rooms are 5,5 meters, high 2,8 meters. I’ve noto enough external space for butressing walls and corners. Is It OK and safe if i pin rebars in all the earthbag Walls every 3 meters avoiding butresses and piers? I would add 1/2″rebar about every 22″ (= one per bag). This is quick and easy to do. Rebar pinning is one of the most practical ways of adding a lot of extra strength. I would use free or low cost recycled latex paint. Check your local recycling centers. The bags tend to suddenly deteriorate in my experience. They look and feel fine for a number of weeks and then suddenly fall apart. Ideally you can cover the jobsite with large tarps to block the sun and rain. I just finished reading your book cover to cover and it was most excellent. Nearly every question I had was answered, and the ones that were left I can ascertain will be answered in the Design book. Thank you! That’s great to hear. Great idea. Thanks. I’ll take pics and share how it goes, very exciting and the little house is going to be beautiful! Hmmmmm. I like that great photo with the sheet metal connecting the door buck to the earth bags. I have a whole bunch of sheet metal that is about 4″ wide that is predrilled with holes. Couldn’t I put nails facing up through most of the holes for skewering the bales on and put two strips exactly the width of the bales apart? Then I could screw them into the bags before they cure up (I’m using the site soil with a little portland cement) and they’d harden up around the screws, right? I just really want something to attach the bales to the bags without pounding rebar through the bales into the bags. Sure, you can anchor bales to bags. Screws aren’t necessary. They are a little pricey. I think I would use the metal anchors and drive in nails at different angles. This will only work if the earthbag course immediately below the bales is made with tamped soil. I love what you do, your book, earth bags in general and my new project! I just broke ground on a little straw bale house (20 x 30 exterior) and started my earth bag foundation over the weekend. I’m thinking now that I see it that I would still really like a nice toe-up made from 4x4s like I usually use under the bales when working with a concrete foundation. Any suggestions about how I could have the best of both worlds? Can I attach 4x4s to my earth bags? Also, I’m a bit afraid that I’m going to not have enough left on my continuous roll of polypropylene bag material and would love to order a small roll of 16″ material super fast. Possible? Thanks very much for what you do! Very empowering for this 50 year old woman who has always dreamed of living in a hand built house. Thanks Kim. Standard gravel bag foundations can be raised above the finished floor level. This puts the soil-filled earthbags at least 12″ above the ground outside and about 6″ above the floor. That means the bags are protected from plumbing leaks, heavy rains, etc. In addition, your building site should be on high ground or raised so water flows away from the building. All these precautions are recommended because water is the number one enemy of buildings. No need for a wood toe-up with earthbags. It’s a potential weak link in a heavy wall system that could rot. Poly gravel bags (double bagged for strength) should last indefinitely. You can look up the US highway study on poly bag durability if kept out of sunlight. They could easily last 500 years or more. You can attach wood to earthbags with various types of anchors. Look up sheet metal anchors on this blog. If you want to add wood posts, you can put them against the inner or outer sides of the walls, or inside the wall. I like putting posts on the interior so you can see the beauty of the wood. Simply set the post in concrete and/or set it on a strong stone base and wedge the sides with rocks and gravel. Good luck and please take lots of photos and let us know how things turn out. please someone awneser my time sensative queston. I live in Sioux City IA and could get a bunch of sand bags. Filled sand bags. Big flood on The Missouri River. I would like to know if they can be used for fill. Need about 12 feeet of fill on a lot. Would like to build a slar passive home? Earthship? Sand bag home? Filled sand bags are much harder to work with than filling bags in place. Normally you deliver the soil near the structure you want to build and then fill the bags in place so you don’t have to move heavy bags. But it may be okay if you want to raise the site. 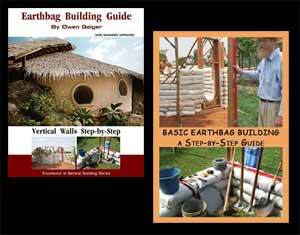 Earthbag earthships are one of the best designs, made with one of the best materials…. highly recommended. After spending a lifetime in construction, I too cannot emphasize enough for new builders to take their time and use established techniques. Established building practices have evolved over the years and are tried and true.There is really no need in many instances to try to re-invent the wheel. Professional techniques save time and material because they were invented and implemented by people who build for a living. Cost conscious builders, tradesmen, material manufacturers and developers have already done the homework. Often new builders want to take short cuts either to save time or money. This line of thought usually ends in problems down the road. New builders are far better off trying to learn and become skilled at certain techniques rather then trying to devise new ones or skipping them all together. Proper sequence of building is almost as important as good technique. Forgetting a step or planning on doing something later in the build can turn an hour job into a 3 day project. Try to plan out your building and allow enough time to complete each step. Today with the world wide web, there are millions of websites available to the novice home builder. Some are written by professions (like Owen) and others are by novice home builders. The new builder should research who is offering up the information they are going to use to build their home. I have seen some home building sites that include photographs detailing construction that is unsafe, will leak or will take lots of work to get correct. Who knows how many other people used those photos as a guide and are suffering for it today. If you can’t find the time to do it right the first time, where will you find the time to fix or repair it. thank you for this Im building a 5meter by 6.5 meter home small and kind of square iv used bob wire for the first 7 layers but Iv run out of cash for bob wire was thinking I could keep going without bob wire Im using brick force for the corners Im using a mix of claysoil (african) sand from the granite quary and a little cement they are hard as rocks do you think its ok to keep going without bob wire???? Earthbags turn very hard, which increases compressive strength. That’s good. But tensile strength is required to keep the building from pulling apart. But on the other hand you say you have no money, so you can only do so much. Maybe a good bond beam will be sufficient if you’re not in a seismic area. Maybe you can find some rebar to drive down through the bags. Maybe you can find some mesh and tie it together through the wall. Someone the other day suggested cutting mesh bags (sometimes available for very low cost). So look for alternative ways to reinforce the building if you can’t afford barbed wire.